S M Ong: #tbt Were you invited to join the Inconvenient Questions debate too? #tbt Were you invited to join the Inconvenient Questions debate too? When I first read this news, the name Inconvenient Questions sounded familiar. So I was invited (along with my "society and its members") to join a debate that Inconvenient Questions was organising. My first reaction was, what the hell is Inconvenient Questions? I had never heard of it before. My second reaction was, Inconvenient Questions is such a terribly awkward and self-important name. 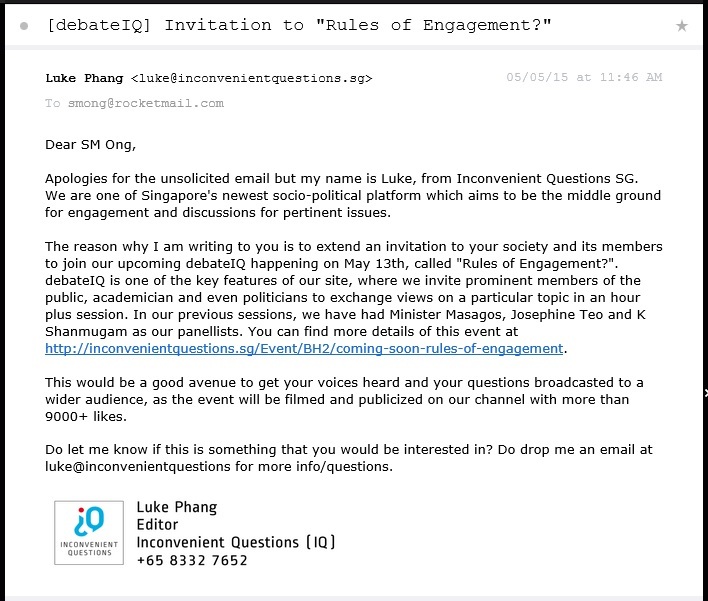 Even worse, on the latter website, Luke Phang embarrassingly forgot to delete my name after copying and pasting the invitation. Anyway, I didn't respond to the e-mail. I haven't heard or read much if anything about Inconvenient Questions since then. That is, until the news about its shutting down. Ironically, by announcing that it will cease operations next month, founder Viswa Sadasivan is probably generating more interest in Inconvenient Questions than its actual content ever did. I mean, even I'm writing about it in this blog post. Still, you got to hand it to these Old Media types like Viswa and Six-Six News' Kannan Chandran, who are at least trying to adapt to New Media, albeit probably not as successfully as they hoped.